May 12, 2010 - With the national jobless rate front page news, the aviation maintenance industry continues to be a major employer around the country and an important economic contributor in many states. For the first time, the Aeronautical Repair Station Association (ARSA) has provided a snapshot of the industry’s state-by state footprint. 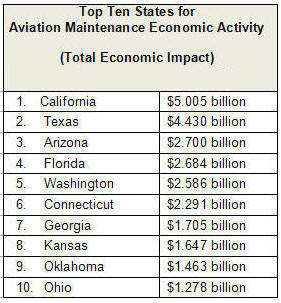 The study, prepared by AeroStrategy, based on 2009 government and industry data, pegs the U.S. civil aviation maintenance workforce at 274,634. The industry’s direct and indirect impact on the U.S. economy is $39 billion. The study found that maintenance, repair, and overhaul (MRO) accounts for 85 percent of the industry’s jobs in the United States with 233,237 employees. Repair stations certificated by the Federal Aviation Administration (FAA) are the largest employer, with nearly 200,000 workers. The remaining 33,300 are employed with non-part 145 firms, including air carrier base maintenance and line stations. Parts manufacturing and distribution account for the remaining 15 percent of industry employment, with 41,397 workers. 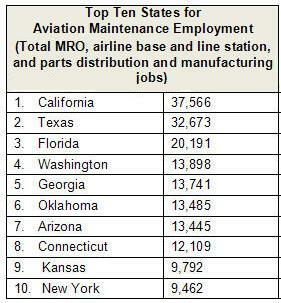 MRO generates over 60 percent of the industry’s economic activity or $24.1 billion, AeroStrategy determined. Although only accounting for 15 percent of total employment, parts manufacturing and distribution accounts for 38 percent of the total economic activity or $14.9 billion. There are six times more people working for repair stations than are employed by the airlines to perform maintenance work “in house”. Repair stations (many of which are small businesses) employ 199,913 people, while only 33,324 are working directly for airlines at base maintenance facilities and line stations. Repair stations are highly specialized and get better return on investment in training, equipment, facilities, etc. Airlines therefore rely on them to reduce costs while achieving the highest level of safety. “Maintenance may be the least visible segment of the aviation industry, but this study makes it clear that in addition to helping U.S. airlines become safer and more competitive, repair stations make significant economic contributions throughout the country,” ARSA Executive Vice President Christian Klein said. ARSA is an Alexandria, Virginia-based trade association that represents aviation maintenance and manufacturing companies. The association has a distinguished 25-year record of advocating for repair stations and providing regulatory compliance assistance to the industry.